OTT Hydromet has launched a new non-contact surface velocity radar (SVR) sensor that dramatically improves the simplicity and reliability of stream, river and open channel measurements. Located safely above the water flow, the instrument is protected from the harmful effects of storms and floods, and can be easily integrated into a remote monitoring system. With reliability as the primary objective, a number of key features have been incorporated into the SVR 100, some of which are unique. The instrument employs a highly accurate radar for non-contact operation and includes sensors for detecting potential sources of error. 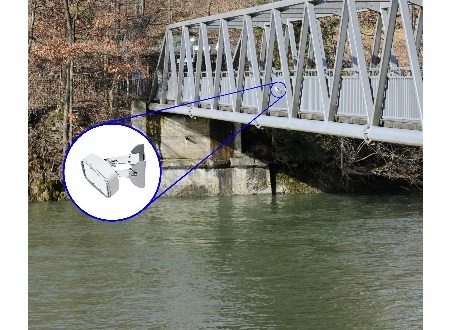 Measurement reliability is validated by meta data from an integrated sensor that detects the effects of bridge vibration from wind or vehicles, and another which monitors the angle of the SVR 100 to the water surface. However, the instrument is also IP68 rated, which means that it is extremely rugged and would even survive complete immersion. Compact and lightweight (1.53 Kg including mounting bracket) the SVR 100 is quick and easy to install in unobtrusive locations, with flexible mounting options for either horizontal or vertical surfaces. Importantly, installation does not usually require any staff to enter the water, which is safer and saves cost. Once installed, the SVR 100 operates on extremely low power, and can run from a solar powered rechargeable battery, with no ongoing requirement for calibration or maintenance. The radar sensor uses the Doppler effect to measure surface velocity from 0.02 to 15 m/s with ± 0.01 m/s accuracy. Automatic data filters are applied to remove the effects of wind, waves, vibration or precipitation. Many users will also employ a level sensor and a datalogger to enable the onsite computation of discharge, and with an SDI-12 protocol, RS 232 / RS 485 interface and Modbus compatibility, the OTT SVR 100 offers a wide range of communication options. Both OTT Hydromet and Sutron manufacture a range of compact battery powered dataloggers, designed specifically for hydrometeorological applications. The OTT netDL for example, offers a sensor template to streamline configuration in the logger, enabling a plug-and-play user experience for the SVR 100. Similarly, other OTT and Sutron sensors can be quickly and easily configured for water level measurement, including the OTT Radar Level Sensor (RLS), Pressure Level Sensor (PLS), or Bubbler Sensors (CBS or CCFB). These dataloggers offer a range of communication methods including satellite, cellular, ethernet and radio; all of which enable remote viewing and collection of data to further lower costs and reduce the requirement for site visits. The OTT Hydromet Group manufactures products that enable water professionals to monitor the planet's most precious resource. Through the delivery of accurate reliable data, OTT's instruments and services provide essential tools to help protect the environment. From precipitation through surface and ground water to marine monitoring applications, OTT's measurement and communication technologies provide a complete picture of the water cycle. OTT and Hydrolab have been longstanding members of the OTT Hydromet Group. Adcon Telemetry was acquired in 2011, Sutron and Lufft joined the group in 2015, and Kipp & Zonen joined in 2018, which means that the company is able to offer the best sensors and data handling technology for every application. Completely focused on hydro-meteorology and water quality, OTT products have been market leaders for over 140 years and coupled with modern communications technology provide remote access to continuous monitoring data. For more information, visit www.ott.com.